That the history Grötzingens is over 1000 years old, is a document of the monastery Weissenburg in Alsace, the village 991 n. Chr. Possession as "Grezzingen" identifies. However, the actual settlement history is not used to this day. In the 2nd and 3rd century. Chr., The region was colonized by the Romans. One of its streets ran from Ettlingen coming towards Heidelberg on today's Staigstraße where you made ? ?discoveries such as coins, bronzes, architectural remains and grave stones of their culture, as elsewhere in the old district. In the 3rd century the Romans were driven by the Alemanni in the region. From those days there in Grötzingen no documented findings, so that only in the time of the Franks by grave finds colonization is detected in the 6th century. On both sides of the Pfinz numerous discoveries have been made since the 19th century. 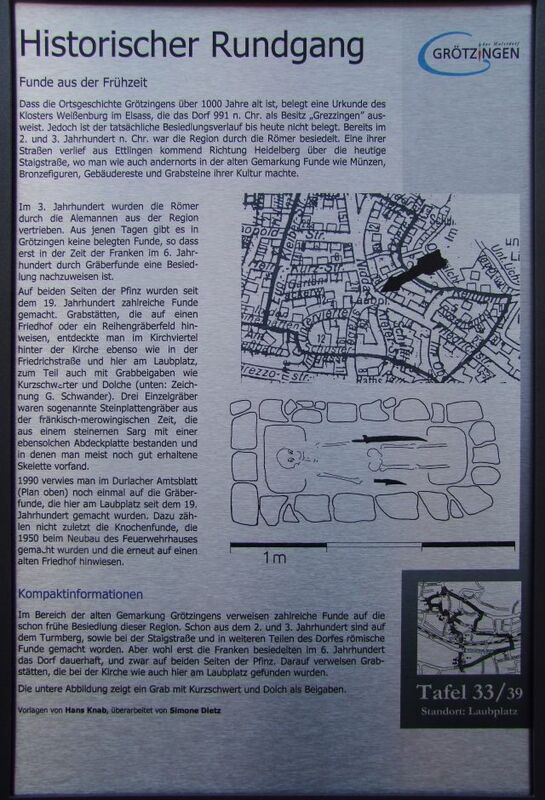 Tombs that point to a cemetery or a series of burial ground, was discovered in the parish neighborhood behind the church as well as in the Friedrichstrasse and here at the Feast place, partly also with grave goods such as short swords and daggers (bottom: drawing G. Schwander). Three individual graves were so-called stone slab tombs of the Frankish-Merovingian period, which consisted of a stone coffin with a similar cover and where you vorfand most well-preserved skeletons. 1990 referred to in the Official Journal Durlacher (schedule above) once again to the grave findings that were made here at the Feast place since the 19th century. It would include the bones, which were made ? ?in 1950 when construction of the new fire station and pointed to an old cemetery again.